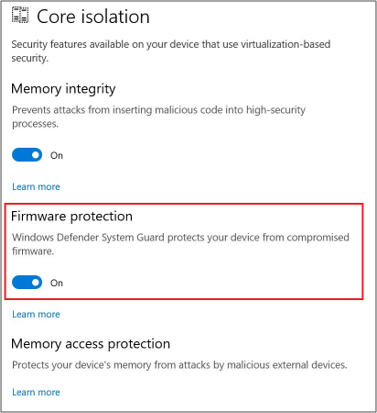 This topic explains how to configure System Guard Secure Launch and System Management Mode (SMM) protection to improve the startup security of Windows 10 devices. The information below is presented from a client perspective. 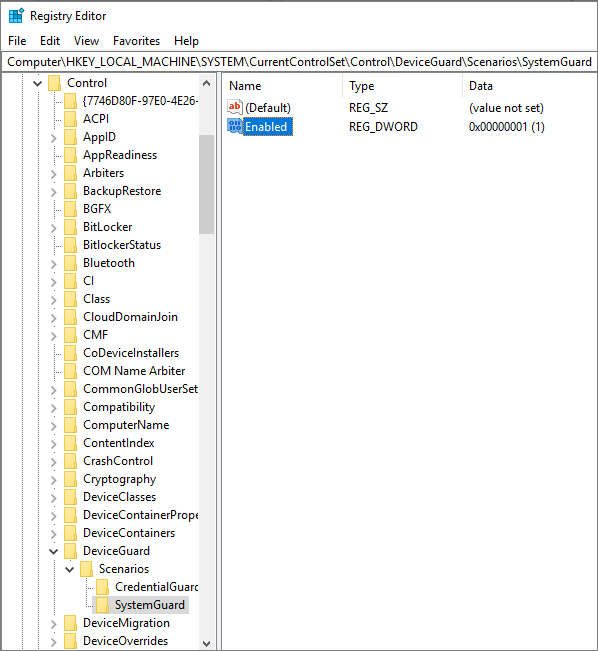 System Guard Secure Launch can be configured for Mobile Device Management (MDM) by using DeviceGuard policies in the Policy CSP, specifically DeviceGuard/ConfigureSystemGuardLaunch. Click Start > type and then click Edit group policy. 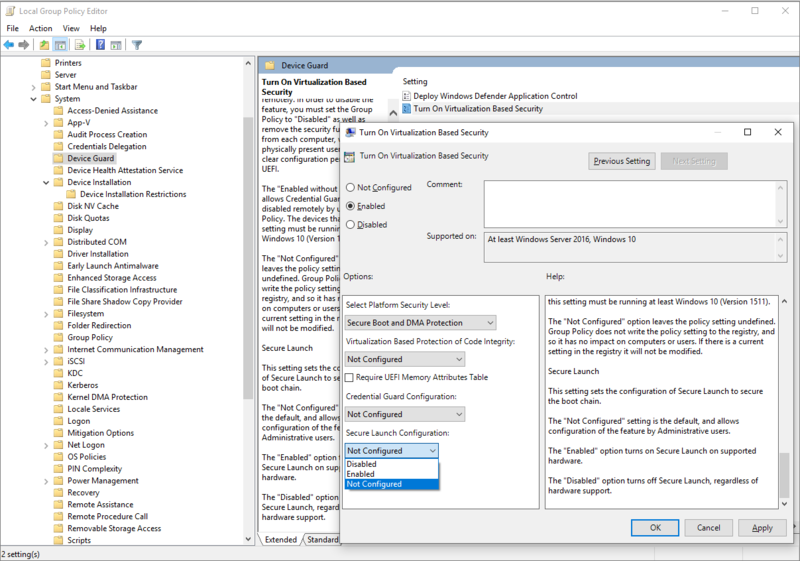 Click Computer Configuration > Administrative Templates > System > Device Guard > Turn On Virtualization Based Security > Secure Launch Configuration. Click Start > Settings > Update & Security > Windows Security > Open Windows Security > Device security > Core isolation > Firmware protection. Click HKEY_LOCAL_MACHINE > SYSTEM > CurrentControlSet > Control > DeviceGuard > Scenarios. Right-click Scenarios > New > Key and name the new key SystemGuard. Right-click SystemGuard > New > DWORD (32-bit) Value and name the new DWORD Enabled. Double-click Enabled, change the value to 1, and click OK.
To verify that Secure Launch is running, use System Information (MSInfo32). Click Start, search for System Information, and look under Virtualization-based Security Services Running and Virtualization-based Security Services Configured. To enable System Guard Secure launch, the platform must meet all the baseline requirements for Device Guard, Credential Guard, and Virtualization Based Security. 64-bit CPU A 64-bit computer with minimum 4 cores (logical processors) is required for hypervisor and virtualization-based security (VBS). For more info about Hyper-V, see Hyper-V on Windows Server 2016 or Introduction to Hyper-V on Windows 10. For more info about hypervisor, see Hypervisor Specifications. Trusted Platform Module (TPM) 2.0 Platforms must support a discrete TPM 2.0. Integrated/firmware TPMs are not supported. Windows DMA Protection Platforms must meet the Windows DMA Protection Specification (all external DMA ports must be off by default until the OS explicitly powers them). SMM communication buffers All SMM communication buffers must be implemented in EfiRuntimeServicesData ,EfiRuntimeServicesCode , EfiACPIMemoryNVS, or EfiReservedMemoryType memory types. SMM Page Tables Must NOT contain any mappings to EfiConventionalMemory (e.g. 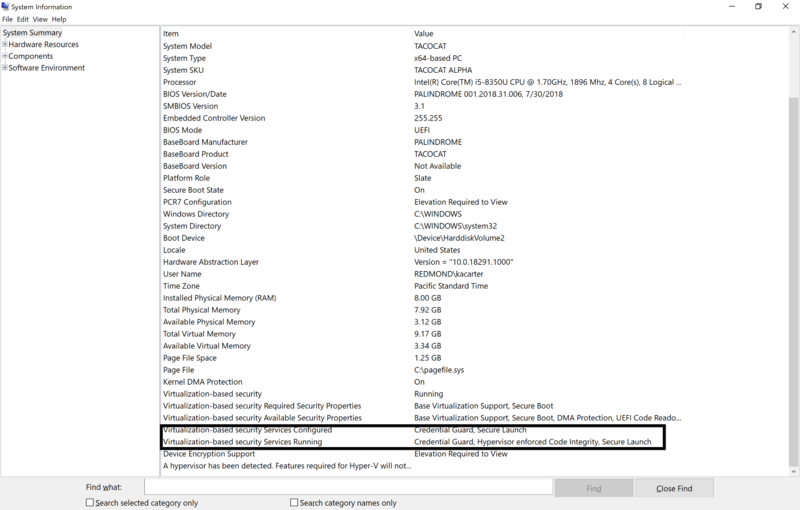 no OS/VMM owned memory). Must NOT contain any mappings to code sections within EfiRuntimeServicesCode. Must allow ONLY that TSEG pages can be marked executable and the memory map must report TSEG EfiReservedMemoryType. BIOS SMI handler must be implemented such that SMM page tables are locked on every SMM entry. Modern/Connected Standby Platforms must support Modern/Connected Standby. In addition, it must have been initialized and locked (TPMA_NV_WRITTEN = 1, TPMA_NV_WRITELOCKED = 1) at time of OS launch. Platform firmware update System firmware is recommended to be updated via UpdateCapsule in Windows Update. Platform firmware Platform firmware must carry all code required to perform a launch.